Forestry has been an important industry to Marlborough since the earliest European settlement. In the early days, no thought was given to sustainability or management, and companies like Brownlie's Milling were only interested in extracting as much timber as possible out of the indigenous forests. Early deforestation as a result of uncontrolled logging led to erosion, and major silting in parts of the Marlborough Sounds. With the increasing number of trees reaching maturity, harvesting has put a considerable amount of pressure on local roading infrastructure with the increase in traffic from heavy logging trucks. 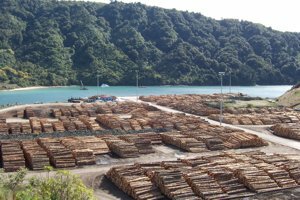 A large proportion of the logs harvested are exported, and to facilitate this, the site of a former freezing works at Shakespeare Bay near Picton was converted into a deep water port and log storage area. With the booming viticulture industry, a strong local market exists for posts for use in establishing new vineyards. These are provided from thinning of young forests. Forestry workers have the potential to earn good incomes, but need a good level of physical fitness. The work can be dangerous, and a number of initiatives have been undertaken to improve the safety record of the industry.